Adorable look and great bag!!! Don't miss my LADY-Rock look...with amazing metallic toe cap heels!!! Love the top with the colors you picked out. That bag reminds of the Mulberry bags for whatever reason. You look great as always!! Love your bag! Looking great as always! Beautiful spring look - loving the pastel colors on you! Got to love the mint color pants! super outfit , like your rings ! Beautiful look on ou. The top goes perfect with so many things. It's a great buy. If you get a sec, check out my latest post 'stripes galore'. Thanks in advance. I love how you managed to keep the outfit girlie, but not too sweet, by adding this houndstooth top! love the pastels with black and white! Love the more sophisticated print paired with the fun mint green pants....so cute! Simply stunning! Love your top! Beautiful! The pattern of your shirt looks great with the mint pants! Seriously, that top is too cute! The houndstooth is such a classic print and goes perfectly with your mint green pants. Fabulous Fash indeed! Such a cute houndstooth top. You look darling! This is such a unique and fun combination. I love everything. Stunning, Anna. That bag and gorg and goes flawlessly with that purse. I have similar mint jeans that I have been wearing on a daily basis basically since I got them! Love! Mint jeans are definitely my favorite right now, yours are so cute! i need to step inside your closet, girl!! Great jacket. Love the houndstooth. Don't forget to link up today: show me your favorite spring trend. I'm also hosting a giveaways for a $300 gift card to Gap/Old Navy/Banana Republic. Stop by and enter. I just bought a super amazing black MK handbag with gold and rose gold hardware. Beautiful. But, I'm insane and think I need a cute spring colored bag now. This post did not help matters! I need that bag too! You're slaying this look. The mint with the black and white is brilliant. love, Love, LOVE this top ! Fabulous spring outfit! I must get my houndstooth dress out! Thanks for the reminder. Love the houndstooth and the mint! I have a similar shirt to yours, love how you paired it with a bright mint jeans. You look beautiful as usual! This is such a cute outfit! I swear, you might actually talk me into attempting a peplum again, you look so cute in them. You look incredibly beautiful, Anna. The blue jeans are amazing. I am rеgular гeader, how are уou eveгуbody? This post posted at this website іs genuinеlу nicе. 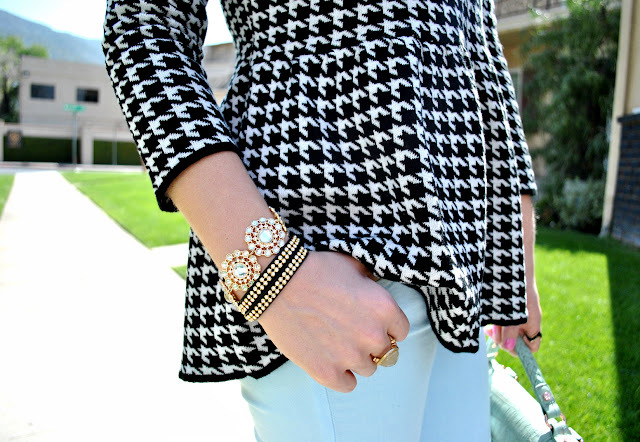 Love the houndstooth with the light blue! Such a cute look! Loving that houndstooth top and your pants together. Love the houndstooth. Its so in. Check out my blog. I'm hoping you'll like it. Love that shirt! You look super cute Ana! I adore houndstooth anything. I love how you paired it with mint green jeans! this top is tooooooo cute!! So sweet! 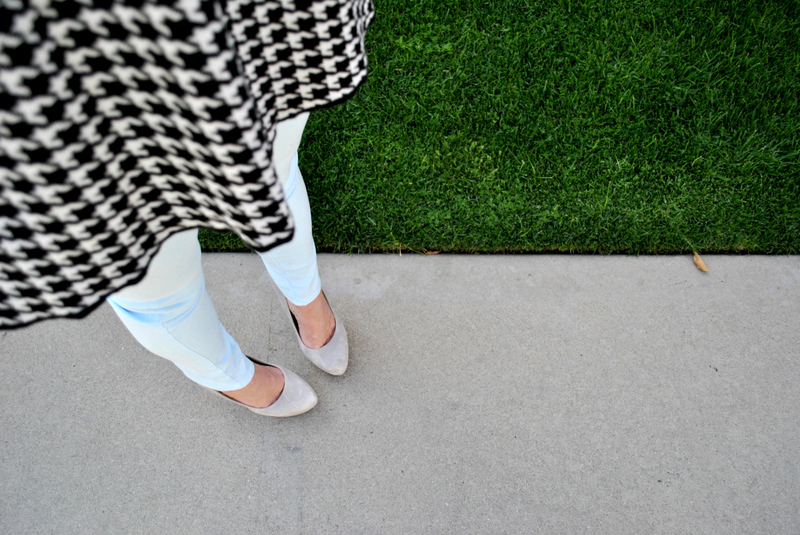 Love how you mixed the classic houndstooth with the fresh trendy mint jeans! I am now following you on GFC and Bloglovin. so cute! Love the your bag! Love the mint on you Anna! I love your jeans and bag! I've been looking for some in that colour for ages! :) I'm now following you, feel free to follow back! Stunning combo. That houndstooth reminds me of the University of Alabama though, but I believe you were an Auburn grad right??! You pull it off either way and look fab! Love the mint & houndstooth... very cute! You look amazing! The colors are so fresh and sweet. gorgeous from head to toe! love! Hi dear, how are you? Adore this fabulous houndstooth top, perfectly styled! 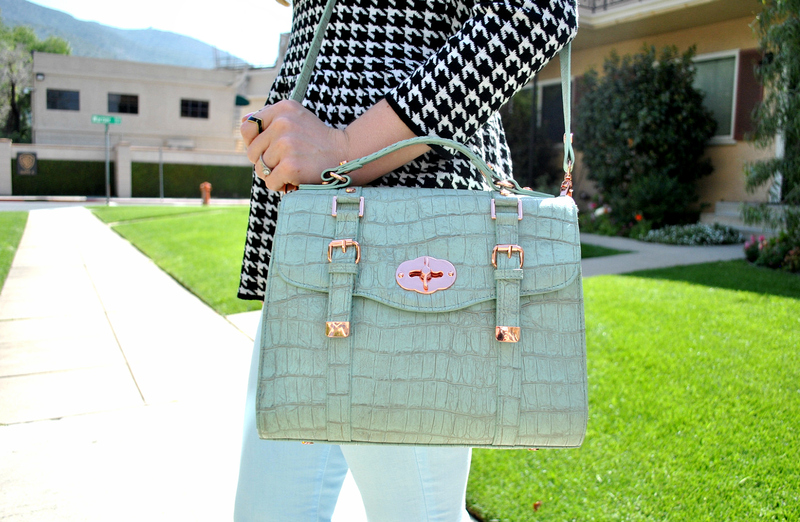 Love those mint jeans and the rose gold accents on your bag! I always associate houndstooth with fall - love how you make it spring with the mint! I am going to need to give this a try! Houndstooth + Peplum= yes please!! Love this look! That bracelet is so cute!! Super cute outfit, loving your purse!! Houndstooth is my fav pattern !! Even I am wearing same in my new post !! I love that houndstooth! I think it looks great with the pastels. Loving the houndstooth! Your hair is gorgeous, I'm jealous! Thanks for stopping by my blog and commenting! i love the color of you're bag ! want the same ! Your hair look good and I love the pants and their color!! !